Wolf, Nicholas M. (2014). An Irish-Speaking Island: State, Religion, Community, and the Linguistic Landscape in Ireland, 1770-1870. The 19th century is commonly regarded as the century in which the Irish language suffered a calamitous collapse: a century in which it survived on the margins, largely irrelevant in politics, in law, in education. English (it is argued) was the vehicle of modernisation, Irish increasingly the language of the poor, the old, the ragged tellers of ancient stories. In Nicholas Wolf’s remarkable book, this argument is turned on its head. He presents evidence, carefully amassed, that Irish, so far from being marginal, was in fact central to the institutions and processes that brought a modern country into being. Wolf is not blind to the fact that the overall number of Irish speakers was in decline, something very evident by the end of the century. But the population as a whole had been steadily increasing since the 18th century, and reached its peak in the 1840s. This meant that there were millions of Irish speakers, and, as he says, ‘simply going about their daily lives through the medium of that language – transacting business, cultivating the land, participating in religious activities, teaching school, and socialising with neighbours – this community necessarily participated in the larger changes to Irish society well underway by the third and fourth decades of the nineteenth century’. Both Church and State had to come to terms with this. The earlier Elizabethan ambition to make Ireland part of an English-speaking polity had come to seem less urgent once a Protestant ruling class had been established. The language question could, it seemed, now be ignored. The persistence of Irish in the age of modernisation brought a realisation that, one way or the other, the question had to be faced and dealt with. One way of doing this was through education. The National School system, established in the 1830s, had no official place for Irish. In fact, as Wolf demonstrates, teachers had no choice but to use the language in the classroom, and it was common for students to return home to an Irish-speaking environment which did little for their English. In politics the story was no different. Candidates in Irish-speaking areas could not rely simply on English. O’Connell himself, though unsentimental about the fate of Irish, arranged for its use in the vast assemblies where he spoke. People heard political arguments in Irish, questioned them in Irish and voted accordingly. 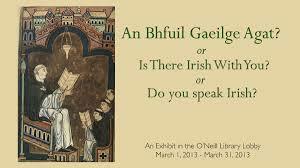 Even the law yielded to the Irish language. Witnesses would insist on using Irish even when they were conversant with English. It was not unknown for magistrates to be Irish speakers, and lawyers with Irish were more common still. It was often a necessary skill, and paid interpreters were a normal feature of many courtrooms. Juries might consist entirely of Irish speakers, some of them knowing no English. The Catholic Church, often blamed as an agent in the loss of the language, was in fact very conscious of the need to minister to Irish-speaking congregations. Bishops took pains to ensure that priests had the appropriate linguistic skills. Wolf also discusses the role of the language in local identification and in landscape naming. He considers the implications of bilingualism and the humour that could arise from it. In doing this he truly describes a world that has gone. ..a speech community that, as long as it existed, was fully capable of negotiating the changes shaping the Ireland that emerged at century’s end. Its members, in the first half of the century and often later, were drawn from all classes and occupations: bishops, members of parliament, judges, doctors, shopkeepers, farmers and their servants, printers and beggars. It is clear from Wolf’s book that the Irish language had an impressive and wide-ranging vitality even in the decades of its decline. Its existence and role, one would think, cannot now be ignored by any scholar of Irish society and culture at home or abroad. Yet old habits of perception die hard. An example is the draft program for the forthcoming Australasian Irish Studies Conference at May (June 2015), with a wide range of papers on the topic of ‘Ireland’s Others: Diversity in History and Culture,’ in which no one has seen fit to address the matter of the language. Its marginality (or non-existence) is assumed. One hopes, in the light of this, that An Irish-Speaking Island will find both a general and a scholarly readership. It is a book which illuminates, a book which will change many minds. And it’s shameful that SBS has a television channel to promote indigenous language and serves pretty much every non English language save Irish. If over 30% of Australians have Irish ancestry it would make more sense to promote the Irish language over minorities such as Arabic, Polynesian or African speakers. Sorry to take so long to get back to you, Garry, but I strongly agree. Is there any possibility of raising the point with SBS? After all, there have been some great programs and films coming out of Ireland recently. The 2016 commemorations promise even more and I’m sure there’d be many people of Irish ancestry who would like to see them. « Recital of unique Irish Litany.